What better way to get myself out of my non-posting rut then a post about a good cause! If you've read my previous posts, you'll know that I'm a huge fan of swishing/swapping and it has come to my attention that quite a few swapping parties and events are going down in the next couple of weeks. Futerra Sustainability communications and the Shoreditch Women’s Institute will be hosting the first accessories swishing party on Friday, 22 May. Swishing started with clothes and for the first time will be expanding to include accessories! Guests will experience a plethora of fun swishtastic activities from a fashion sins confessional booth, jewellery classes and workshops, entertainment by a cool indie band and of course, swishing! Guests are encouraged to bring at least 3 accesories to swish (belts, jewellry, sunglasses, bracelets, necklaces, scarves, hats, shoes, handbags, etc.) Guests who don’t have accessories to swish can bring at least one item of clothing. Unswished clothing at the end of the event will be donated to Cancer Research. 2) Next up is Grazia's and Mary Portas's "Mary's Charity Shop" held at The Village (the posh designer bit - ironic right?) in Westfield shopping centre on 4th June - 27th June. The concept is simple - give your unwanted, unworn, unused stuff in like you would to a normal charity shop (items do have to have a minimum resale value of £5 though - so try to lay off the Primark) and from 4th June you can then buy all the items that have been donated. All money made goes to Save the Children - more info on this event here. 3) And finally it's Feather Duster by Hybird on Sunday 7th June. The clothes swap will run 4-6pm "followed by live, acoustic music from the new and awesome band, Human+ special guests. To participate in the swap please bring at least 1 high quality item of clothing or accessories. There is no upper limit to how many items you can bring, but we aim to keep the quality high, so please, no used sportswear". The event will take place at: Adriadny's Nectar, 274 Latimer Road, London, W10 6QW. 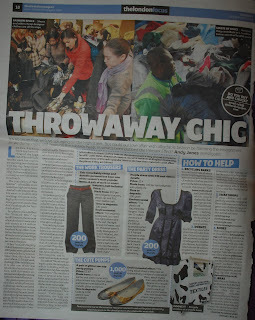 I also found this article I kept from the February 26th 2009 edition of the London Paper about "Throw Away Fashion". I was shocked to find out that a cute pair of glitter Primark pumps could take up to 1,000 years to degrade and the article gives you tips on how you could help - like taking your unwanted bras to Oxfam, which will then make their way to Africa where there are very few facilities for producing them.